Vision McMillan Partners, a joint venture of Trammell Crow, EYA and Jair Lynch Real Estate Partners, has issued the following statement regarding the D.C. Court of Appeals’ December 8th ruling on McMillan. 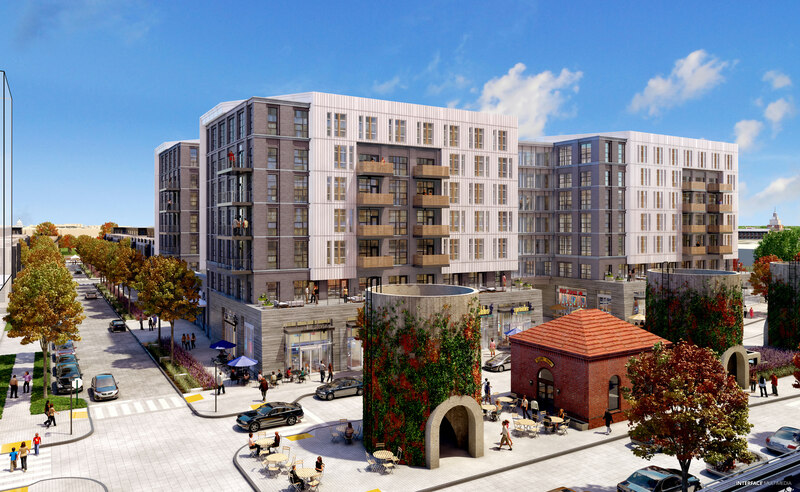 We are disappointed with some aspects of the Court’s ruling for the McMillan site, yet significantly encouraged by its agreement with the Zoning Commission that our project is consistent with the District’s Comprehensive Plan and the Future Land Use Map. This is a clear validation of our development plan. Our team echo’s the sentiments of the Office of the Deputy Mayor for Planning and Economic Development and shares the belief that we can and will address with urgency the issues outlined in the Court’s order. We look forward to continuing our work as planned and are eager to move ahead in lockstep with the District to deliver the jobs, housing, retail, parks and open spaces that Ward 5 and District residents want and deserve. 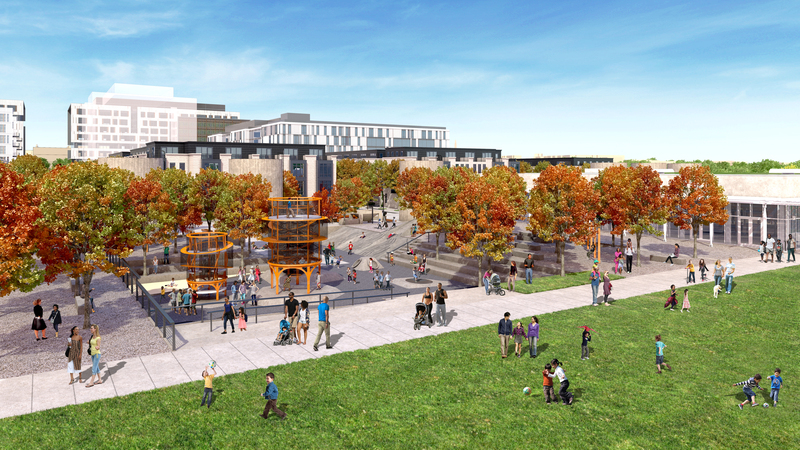 Last Thursday, DMPED, with support from VMP, presented the final concept designs for Parcels 6 & 7 — the new Park and restored Service Courts at McMillan. The Board voted unanimously to approve the designs finding them consistent with or an improvement to the designs approved in October 2013. This approval delegates final permit review to the Historic Preservation Office staff. 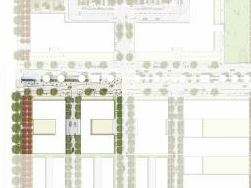 Click here to to view the one-minute animation depicting the approved park design. 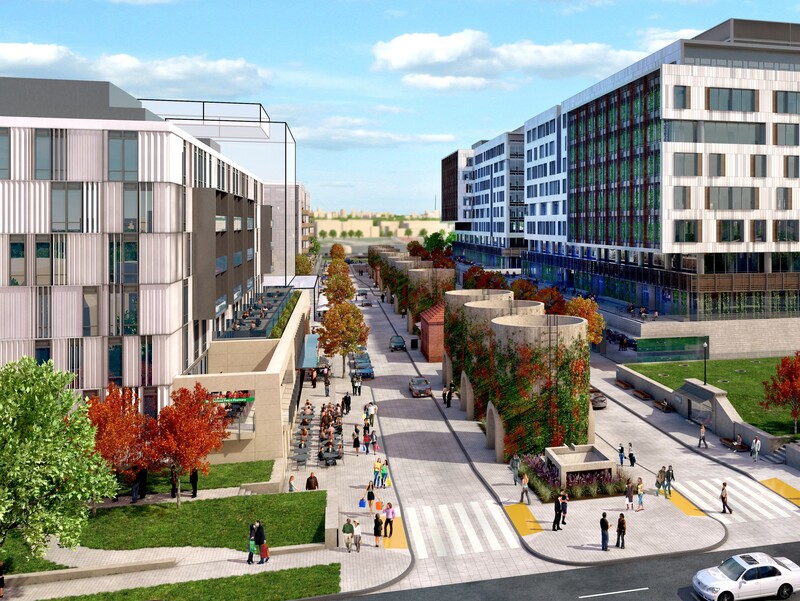 VMP, along with the District of Columbia, is excited to announce an update of the Concept Design has been submitted to the Historic Preservation Review Board (HPRB). 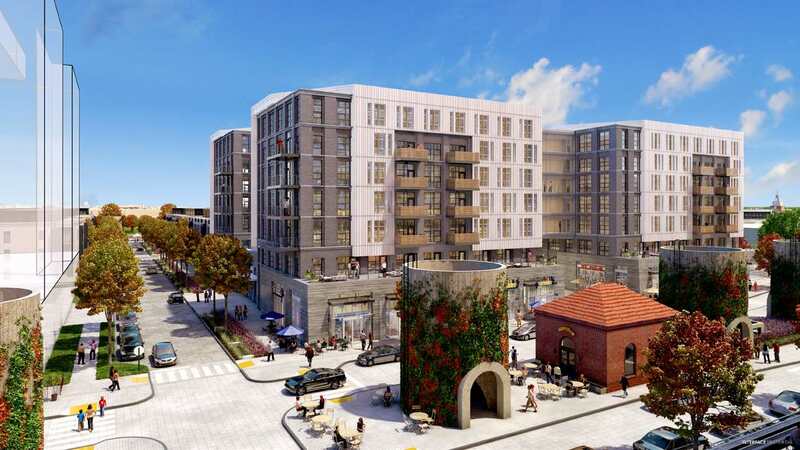 This update is in response to the HPRB’s recommendation that it conduct a final design review of the project following approval by the Zoning Commission and the Mayor’s Agent. The team has conducted additional due diligence and design development in preparation for permitting and construction. The submission materials focus on the public parcels, including the park, service courts and elements within those parcels, that were refined since HPRB approval in October 2013. Click here to view the submission materials. 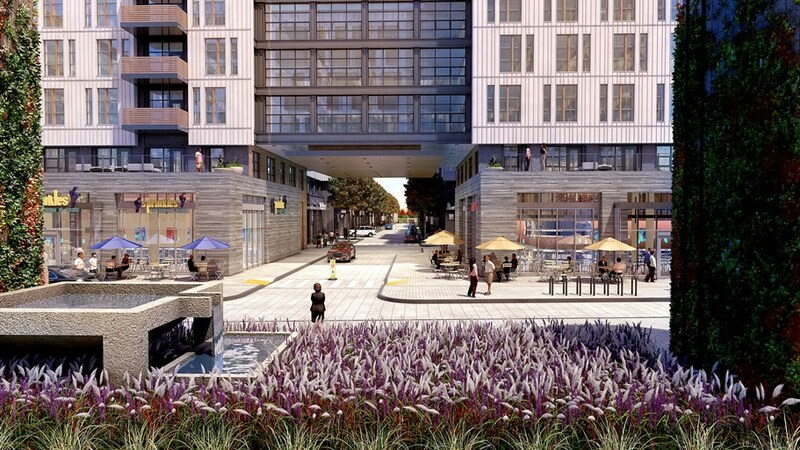 Jair Lynch Real Estate Partners’ request for a revision to the proposed design of Parcel 4, which required a modification to the existing PUD Order, has been approved. The design modification results from Jair Lynch’s signed Letter of Intent with Harris Teeter to activate the building’s ground floor with a full-service 50,000 sf grocery store. The most visible modification results from the creation of a café mezzanine space connected to an outdoor patio above the street level at the corner of North Capitol and the North Service Court. The new public outdoor space offers the ability to experience the North Service Court and its historic structures from the approximate elevation of the existing plinth. Additional design revisions included additional windows, the storefront entry and the incorporation of Harris Teeter’s signage. On the Quarter Street frontage, the overall appearance of the residential lobbies was enhanced to by incorporating additional windows and architectural elements. Harris Teeter’s use of smaller delivery trucks provided the opportunity to decrease the size of the loading dock, which strengthened the appearance of the building on Evarts Street. 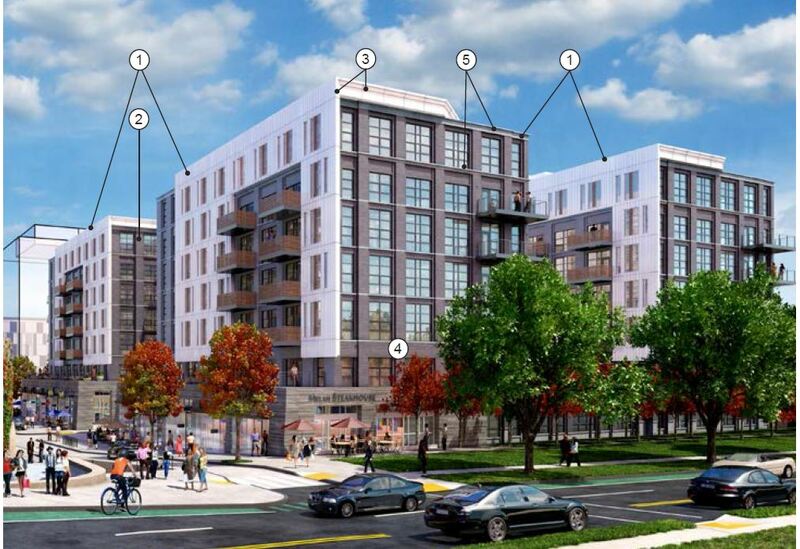 None of the proposed modifications effect the number of residential units to be located on the building’s upper floors, which will include 85 affordable units set aside for seniors at 50% of AMI. 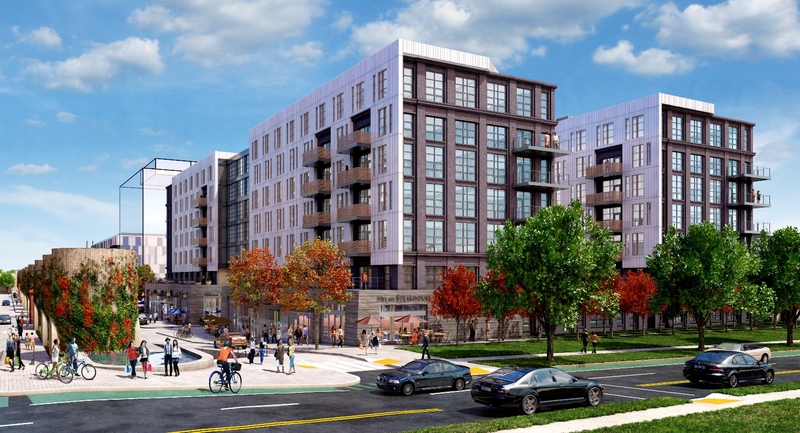 The overall project aims to kick off construction later this year, with the new Harris Teeter and apartments delivering in 2018. The hearing before the Zoning Commission took place on March 10, 2016. Email us at info@envisionmcmillan.com if you’d like more information regarding the hearing. 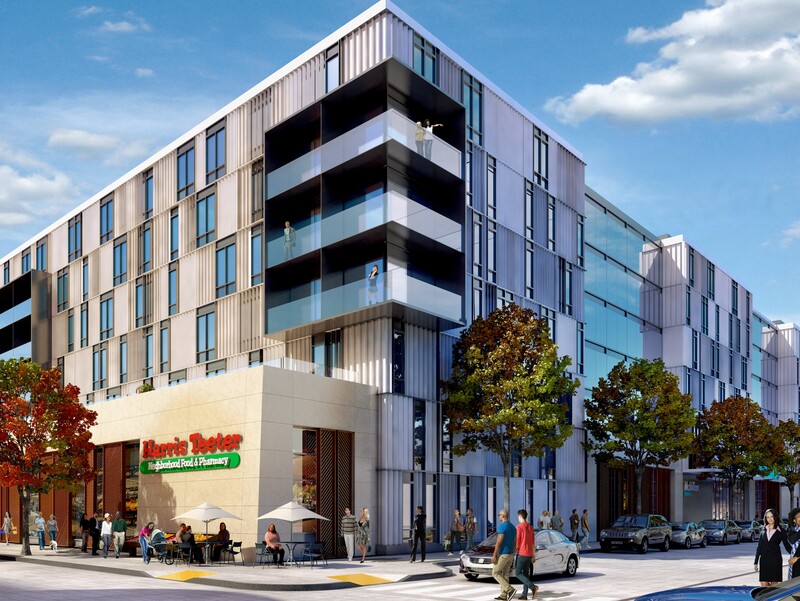 Jair Lynch Real Estate Partners garnered initial approval from the Zoning Commission for their Stage Two PUD Application to construct a 7-story mixed use building on Parcel 2 of the McMillan site. 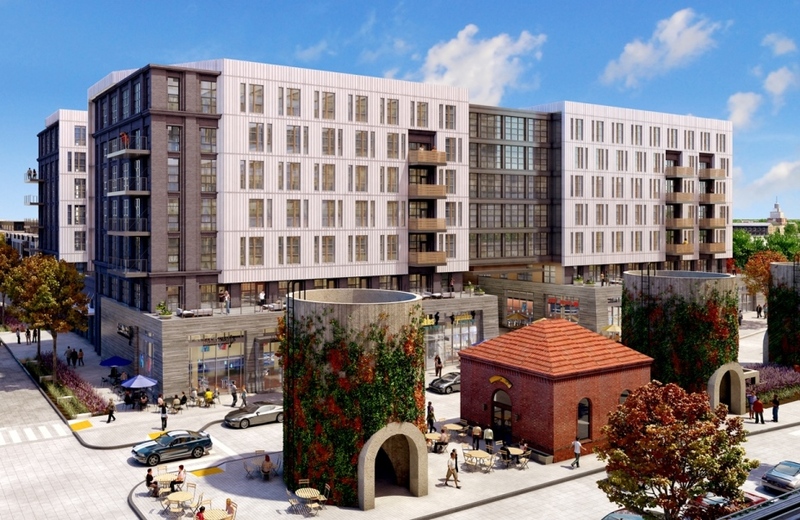 The design for Parcel 2, guided by the Master Plan and Stage One PUD approved in 2014, compliments the surrounding historic resources and draws from a consistent design palette in keeping with other new development on the McMillan site. This mixed-use building will have between 18,000 and 24,000 SF of ground-floor neighborhood serving retail uses. Approximately 236 apartments will be constructed above the retail; 27 of these units will be designated as affordable. The affordability component was enhanced by the addition of two units affordable to households making 50% AMI, while the balance will be available at 80% of AMI. The PUD process also resulted in the design modification of the east-west span connecting the building across Three Quarter Street. That span will be transparent, no longer containing any residential units. The final draft of the PUD Order was submitted to the Zoning Commission, Office of Planning and three affected ANC’s last Thursday, Mar 2nd and is now pending Final Action. 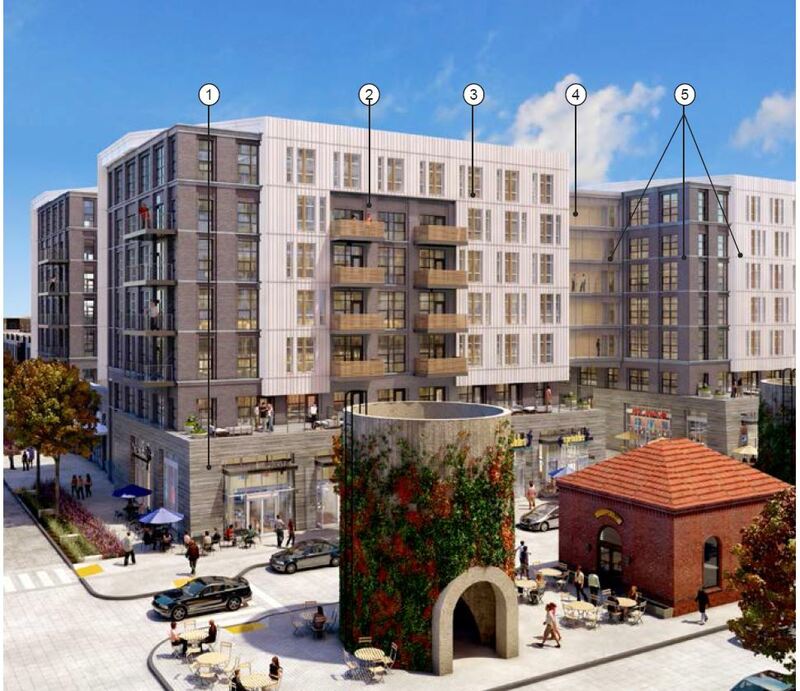 Lauded as a “high bar for architecture” in the District and an “elegant solution that reinforces the ground plain”, in a 6-1 vote the HPRB approved JAIR LYNCH’s proposed concept design for Parcel 2 during their April 30th meeting. 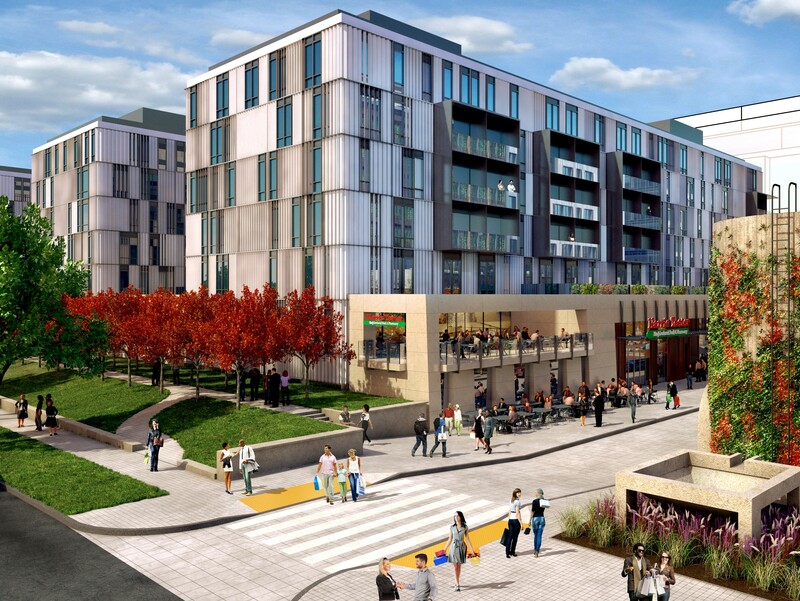 Located between 1st Street and Half Street, the building provides a dynamic and efficient mixed-use program with 250 apartments, of which 25 will be affordable at 80% of AMI, and 15,000 sf of neighborhood serving retail with outdoor seating adjacent the North Service Court and Olmsted Walk. Collectively the design and program optimize the pedestrian experience and benefits to residents, while remaining a backdrop to the historic landmark. 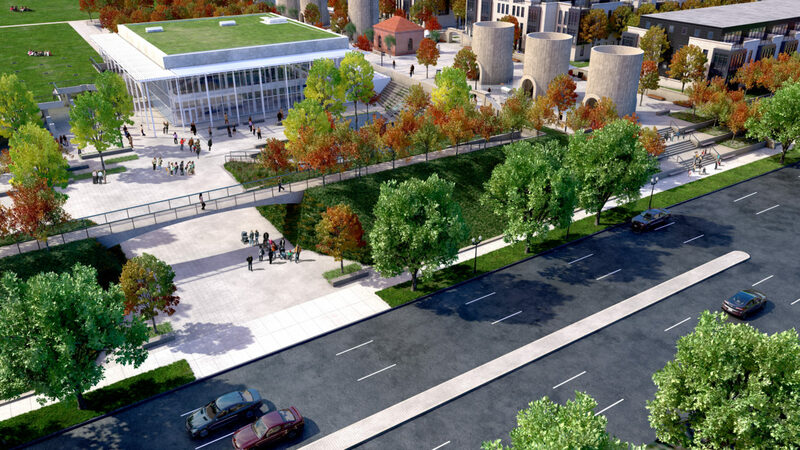 Designed by MV+A Architects, the building is imagined to provide a unique expression honoring the McMillan site as a historic landmark, while relating to the existing approved buildings. 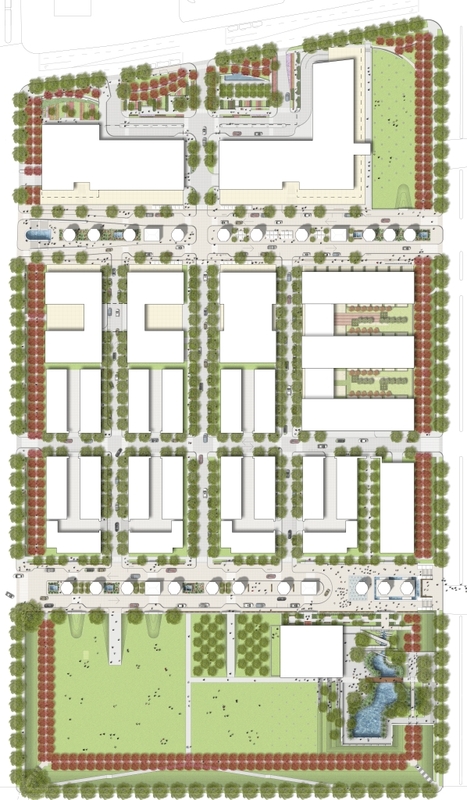 Drawing inspiration from themes articulated in the Master Plan and Design Guidelines to allow for a cohesive place, the design is unified and diverse, while complimentary to the existing historic resources and sense of place that is McMillan. In the weeks following our January 29th presentation to the District’s Historic Preservation Review Board (“HPRB”), the development team facilitated a work session with board members while studying alternative design concepts for JAIR LYNCH’s proposed mixed-use building on Parcel 2. In an earlier post, we illustrated major thematic elements of the proposed design. 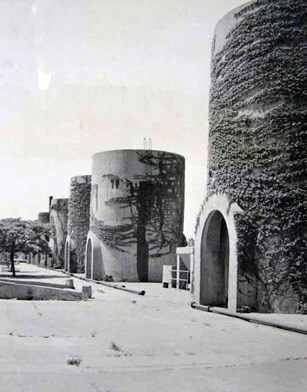 Visioned as a unique architectural expression honoring the site’s historic legacy, while complementing the vertical design of adjacent buildings in order to read as a cohesive place. While our overall conceptual vision was well received by the HPRB in January, it was requested that we review alternative treatments for some design elements, including the proposed Three Quarter Street span, reading of the elevated plinth and detailing of the masonry and metal panel treatments. 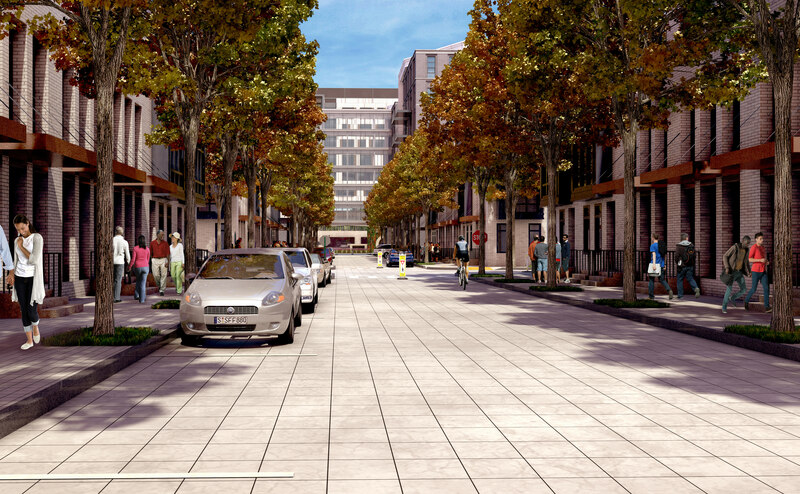 The team is proud to present our evolved design concept for McMillan Parcel 2. 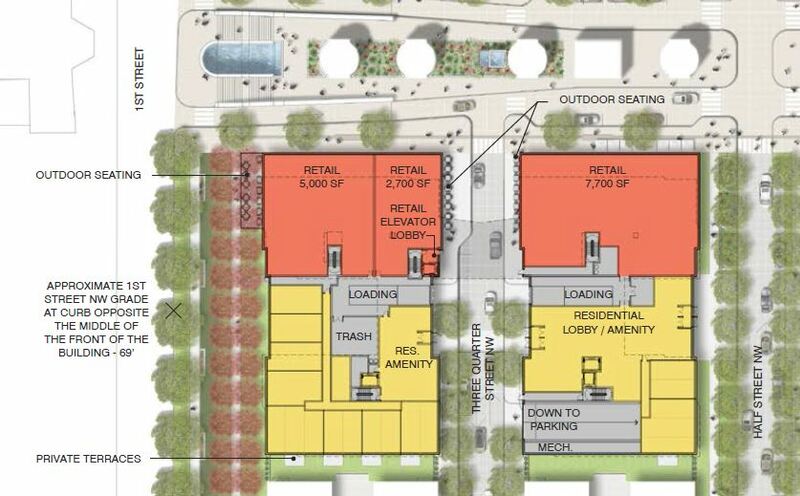 The mixed-use program for the building remains the same, with just over 15,000 sf of neighborhood serving retail on the ground floor and apartments throughout the seven-story building, including affordable units at 80% of AMI. The team looks forward to presenting our revised design concept to the HPRB at their upcoming April 23rd Meeting. For a more detailed synopsis of changes to each design element, please continue reading. In a working session with members of the HPRB, removal of the span across Three Quarter Street was reviewed; however, it was articulated that eliminating the connection between the buildings would have the unfavorable result of creating an interior focused residential project with front entrances to both buildings along Three Quarter Street. Consequently, the buildings would turn their backs on First and Half Streets, placing both loading and parking entrances on Half street. The span across Three Quarter Street consents the building to maintain its front entrance on the more prominent Half Street with secondary entrances, vehicular access and loading on the tertiary Three Quarter Street. To moderate the prominence of the span along the North Service Court, units on the north face of the bridge have been removed. The benefits of this change are numerous. Now with over a 40’ inset from the north plan of the building, the angled form of the span reads an even further recession from the vertical façade along the Service Court. The new setback places the span out of view when looking east or west across the Service Court, resulting in a more pronounced reading of the masterplan’s four-block orientation. Reduced to a width of 33’ underneath, the redesigned span pitches up at its center creating a greater volume of space, thus allowing stronger reciprocal views between historic resources in the North and South Service Courts. The sides of the span are primarily glass, giving it a light and transparent quality setting it apart from the building it connects. The horizontals connections are detailed to minimize their thickness, allowing for larger expanses of glass. The mullion detailing of the glass wall recalls the diagonal pattern of the manhole covers above the underground vaults and further reduces the scale of the span. In addition, it further relates to the window pattern of the larger building it connects, while still maintaining the identity of a single element. Changes to the span element connecting the two structures drove changes in the overall diagram of the building. With the bridge now receding from the North Service Court, the building reads as four identical linear bars of simple geometry. This replicates the massing strategy applied in other planned buildings, as well as the simple and regular geometries common on the historic site. Further amplifying this concept is the consistent treatment of the dark masonry and draped white element central to the design theory of the structure. On each of the four bars, peeled back in an identical nature at the northeast and southwest corners, the draped white screen recalls the landscape as it drapes over the site’s underground filtration vaults. This treatment creates a pleasing visual balance and regularity across the building. 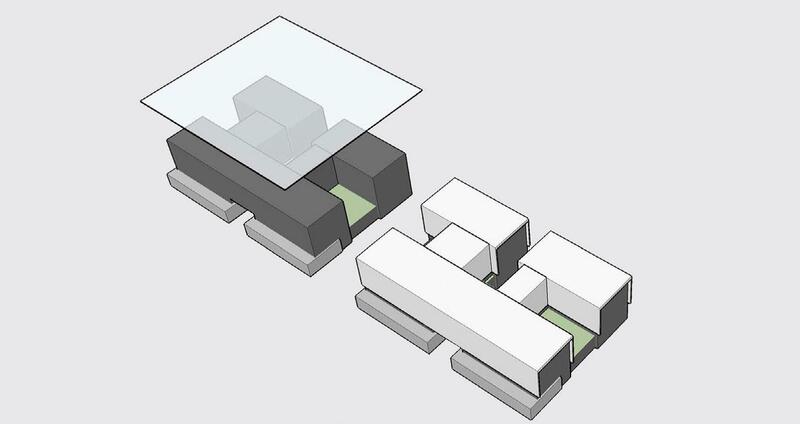 The simple diagrammatic treatment adapts the south elevation of the building to its context and appreciates the scale reduction to the row homes, as the white element folds lower across the elevation. On the primarily white north and south elevations, wood balconies are inset within a cut in the screen, taking on a proportion comparable to the facing sand bins. Accepting the importance of a clear and strong reading of the abstracted plinth wall, the retail plinth design has been edited. Previously glass projections passed across the vertical piers of the stone plinth wall. Now the regular rhythm of the vertical piers is clearly read, with simple projecting retail storefronts infilling the space between. Openings in the sides of the plinth walls draping the building on First Street, Three Quarter Street and Half Street are now integrated into the regulating grid of the masonry form above. Though a divergent treatment to the style of the dark masonry and white metal panel elements is central to the design concept, efforts were made to closer relate these two elements in order for a unified building read. Treatment of the dark masonry architecture is amended to closer mimic the level of articulation and detail found in the historic regulator houses and plinth walls. This reduces the overly jarring connection found previously between the modern detailed white screen and the more neoclassical detailing formerly shown in the brick masonry. Cornices and brick articulation are simplified in order to cultivate a treatment of familiar masonry detailing that relates closer to the contemporary approach of the white screen. Previously, the gridded and banded element illustrated in McMillan’s Design Guidelines was addressed only in the building’s white metal element. Horizontal lines from the element are now pulled into the black masonry architecture through grey cast stone and brick bands. Parallel bands now pass around the entirety of the facade through the metal, brick and glass bridge elements, effectively relating the complete building to the horizontal bands on the formed concrete sand bins. These bands on the masonry element cross the strong vertical pilasters fashioning a gridded pattern that connects to the prominent grid of the historic groin vaults, analogous to the clear gridded nature of the white metal element and glass bridge. A stronger impression of a two-story base is developed within the masonry architecture. This reading is clearly observable on the First, Three Quarter and Half Street facades. The scale and height of this base narrates closely to the scale and height of the neighboring row homes, while the pronounced cornice of the base visually joins with the roofline, facilitating the overall transition in height from the row homes, to the taller Parcel 2 mixed-use building and medical office buildings beyond. Further relating the façade to patterns within the site, the white metal panel element now features a detailed wood colored mullion piercing vertically through the windows, forming a regular vertical rhythm similar to the vertical pilasters of the dark masonry element. A clear cadence of vertical elements is now established throughout the design in the white metal, dark brick and glass bridge elements. Finally, an elegant profile highlights all edges of the white metal element, accentuating its reading of a thin screen draped over the masonry element, effectuating and enhancing interaction between the two. 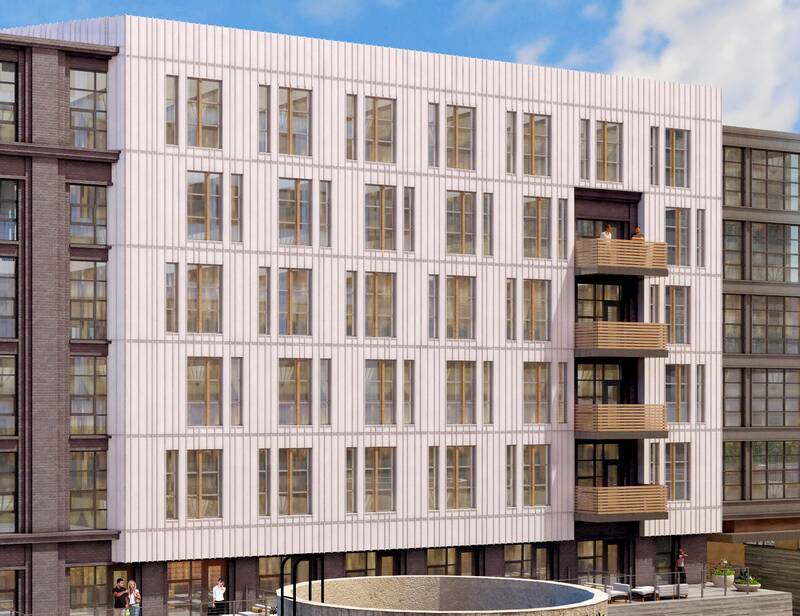 JAIR LYNCH Development Partners has completed a new conceptual design for the second of two mixed-use multi-family buildings and a critical anchor in the reinvented North Service Court. 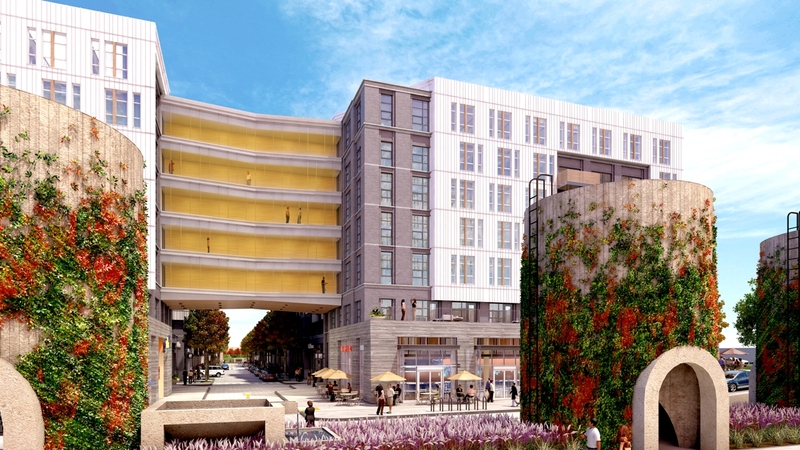 Located on Parcel 2 between 1st Street and Half Street, the building delivers a dynamic, efficient mixed-use program with 250 apartments, of which 25 will be affordable at 80% of AMI, and 15,000 sf of neighborhood serving retail with outdoor seating adjacent the North Service Court and Olmsted Walk. Collectively the design and program optimize the pedestrian experience and benefits to residents, while remaining a backdrop to the historic landmark. Unified Palette – To maintain the cohesion of the site as a singular place, the concept design utilizes a material palette and treatment consistent with existing approved building concepts. The primary building color is white as expressed through a white metal panel facade system; secondary building color of charcoal grey is expressed through charcoal masonry and metal; and a tertiary building color is expressed in the wood balcony railings and accent mullions. 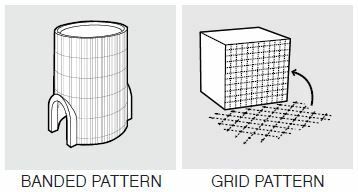 Banded Pattern / Grid Pattern – The banded patterning of the white metal façade treatment relates to the patterning on the sand bins left behind from their construction process. 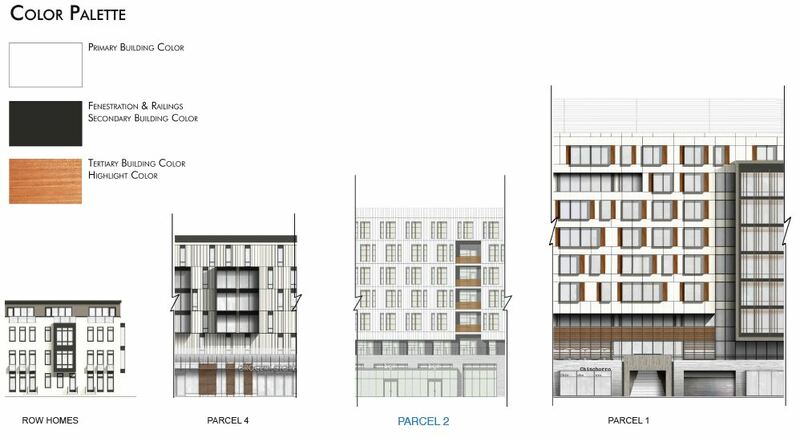 Similar patterning is proposed through different means and materials on other North Service Court buildings. The regular gridded patterns of McMillan are referenced in the simple regular grid of windows on the building’s white metal facade system. The playful dance of its small vertical windows further provides diagonal readings similar to the manhole covers in McMillan’s landscape. 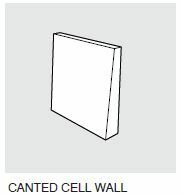 Accented Entries / Portal Passages – The site features a number ofcelebrated portal passageways with accented entries, such as the pronounced framed entries into each of the filtration cells and the bold openings to the sand bins. 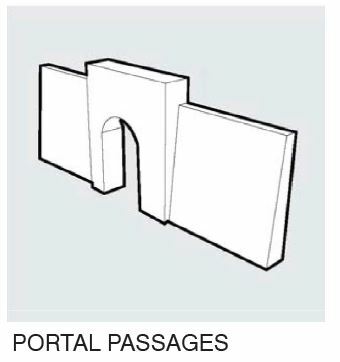 The previously proposed buildings and landscape design employ abstracted portal passageways in a variety of locations and scales. The proposed building creates a portal passageway at the intersection of 3/4 Street and the North Service Court, which frames reciprocal views to and from the North and South Service Courts, creating an intimate, yet activated space to view the preserved historic assets in the North Service Court. North Service Court Cohesion – The design contributes to the cohesive nature of Service Court as outlined by the approved design guidelines. The building respects the unified podium height and setback above the podium in order to evoke the plinth and provide context to the historic elements. 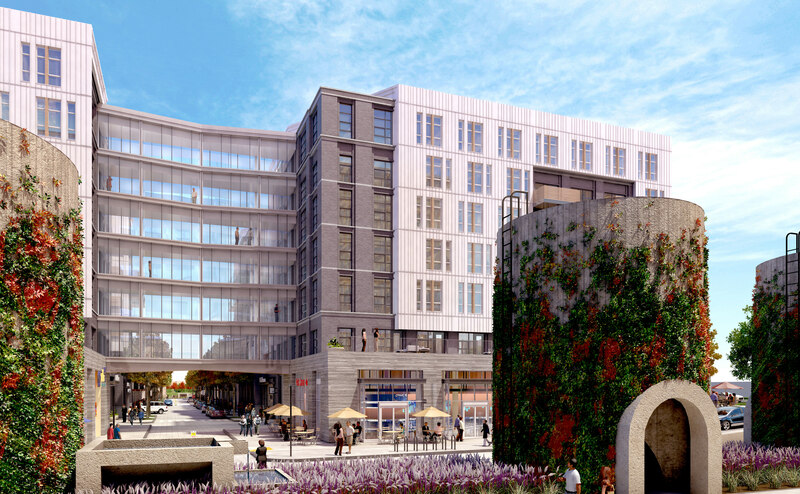 As proposed in designs for Parcel 1 and 4, the podium wall is canted similar to the existing service court wall and punctuated by a portal passage, mirroring a similar design element in the healthcare facility across the court. Formally submitted to the Historic Preservation Review Board (HPRB) for review earlier this month, a hearing before the Board is scheduled for tomorrow, January 29th at 1:30. Check back next week for an upated video highlighting the this latest addition to the New McMillan. Capping off a series of recent approvals by the Zoning Commission and DC Council’s Government Operations and Economic Development Committees, the four resolutions granting the surplus and disposition of McMillan received unanimous passage during the December 2nd Legislative Meeting. The first resolution, The McMillan Surplus Declaration and Approval Resolution of 2014 (PR20-1081), declares the McMillan Sand Filtration Site surplus property pursuant to DC Official Code §10-801, thereby allowing the sale of a portion of the site. In separate actions, the Council unanimously passed Resolutions PR20-1082, PR20-1083 and PR20-1084 granting the sale at fair market value to VMP partners – EYA, JAIR LYNCH Development Partners and Trammell Crow Company. Decommissioned in 1985 following construction of a modernized chemical filtration plant on the adjacent reservoir site, the District purchased the 25-acre site from the federal government in 1987 for redevelopment. In the ensuing years, the District issued several unsuccessful solicitations with no viable proposals materializing due to the complexity of the site. 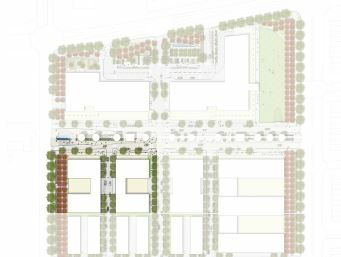 In March 2006, the District transferred jurisdiction of the property to the National Capital Revitalization Corporation (“NCRC”) and after a year-long solicitation and rigorous vetting process, NCRC selected Vision McMillan Partners (“VMP”) in July 2007 to develop the McMillan site. Since 2007, over 200 meetings took place to engage the community on redevelopment plans for the site, including building designs, traffic management, storm water management, preservation and public amenities. During this period, the master plan constantly evolved fulfilling community priorities and to accommodate DC Water’s Clean River Project. Today’s development plan is the culmination of years of extraordinary engagement between the District, development team and community, brought to life by the design vision of talented planners and architects. For more information on the history of the project, see our recently published timeline. In the coming year, VMP will focus on final schematic design and permitting in anticipation of breaking ground in early 2016. 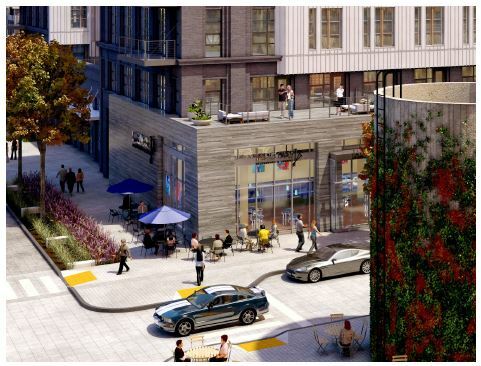 When complete, McMillan will lead the area’s transformation from a crossroads of diverse and unrelated land uses to a walkable mixed-use community supporting and enhancing the fabric of existing neighborhoods. Balancing an architecturally cohesive and distinct new construction element with a carefully considered preservation program and adaptive re-use strategy, McMillan is the next great community in our city.